A serviceable and inexpensive bench vise can be made in the following manner: Procure a piece of hard wood, 1 in. thick, and shape it into an eccentric with an extending handle, as shown at A. The jaws B are made of material 2 in. thick, and the drawbar C is a 2 by 3-in. piece of hickory. 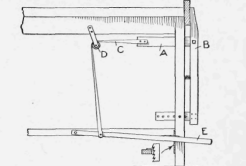 The outer end of the bar is slotted to receive the eccentric handle, through which a bolt, D, passes to form a bearing. Holes are bored into the opposite end of the bar, 2 in. apart, into which a peg is inserted to come against the back side of the rear jaw. This provides an adjustment for a range of various thicknesses of material. Another bar is located at the bottom of the jaws to provide a means of keeping the jaws parallel. This bar is made in a similar manner to the bar C. The rear jaw can be fastened to the side of a bench, post, or any support that may be handy. - Contributed by Wm. S. Thompson, Columbia, Tenn.
A form of a bench vise that can be easily made and attached to a workbench is shown in the illustration. This vise requires no screw, and the parts can be made from scrap material. The substitute A for the screw is a rectangular piece of wood and is fastened with a tenon in a mortise cut in the vise jaw B. The clamping arrangement consists of a strap, C, attached to the piece A, then run over a pulley, D, and fastened to a foot pedal, E. The foot pedal is fulcrumed on a crosspiece of the bench and has a ratchet so as to hold it when the vise is set. 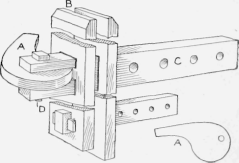 The lower end of the vise is fitted with the usual form of device for parallel adjustment. A coil spring is located in the center for use in quickly opening the vise when the foot pedal is released. - Contributed by A. C. Westby, Porter, Minn.